Next on the list comes a property in Covington, Kentucky. Also located in Kenton County Covington was founded in 1815 and made into city status in 1834. Covington was one of the second largest cities and industrial region in Kentucky, Currently Covington has nineteen different neighborhoods which people can call home. Covington covers 13.7 square miles of land just south of Cincinnati. See more Covington real estate listings. Avondale is a neighborhood in Cincinnati, Ohio and traces its name back to 1853. Located in Warren County Lebanon was first settled in 1796. Lebanon covers 12.97 square miles and is located north east of Cincinnati. See more Lebanon, OH real estate listings. Located in Boone County, Burlington sits on 8.8 square miles of land and was incorporated in 1824. See more Burlington, KY real estate listings. Located in Campbell County was founded in 1911 for the Chesapeake and Ohio Railway. Silver Grove sits on 1.7 square miles of land. This list is subject to change based on properties getting sold or price changes. 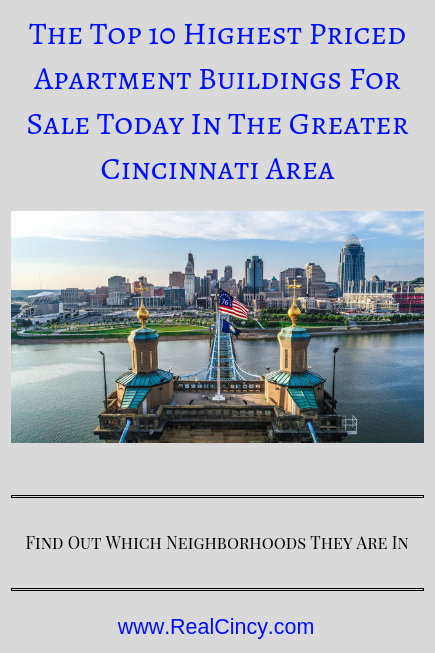 About the author: The above article “The Top 10 Highest Priced Apartment Buildings For Sale Today In The Greater Cincinnati Area” was provided by Paul Sian. Paul can be reached at paul@CinciNKYRealEstate.com or by phone at 513-560-8002. If you’re thinking of selling or buying your investment or commercial business property I would love to share my marketing knowledge and expertise to help you. Contact me today!